Blueberry season is finally here in our backyard garden. Cool weather lasted well into spring, so we’ve had to wait a couple extra weeks for the bushes to blossom and fruit. 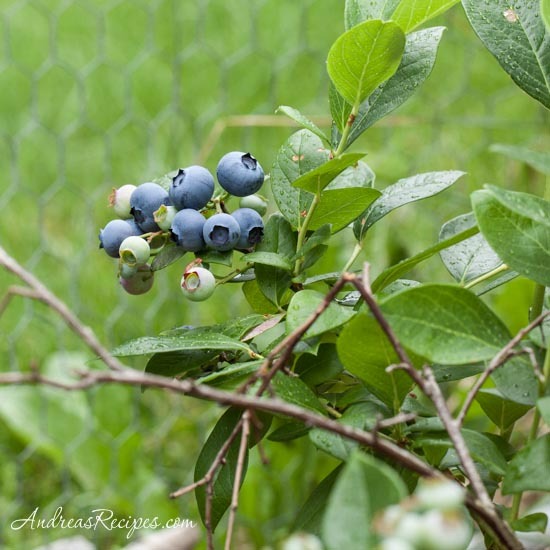 The berries are ripening and all four of my guys are excited about all the blueberry stuff we’ll make over the summer. 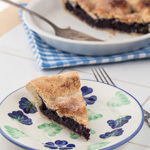 Blueberry muffins, pies, cobblers, jams, and cakes are all on the list. Teaching our boys about food and where it comes from is a big reason why we’ve created our edible backyard garden, and seeing their excitement over the fresh picked berries is worth all the hard work. We planted our first blueberry bushes six years ago, and it took a little trial and error to find the best spot for them. A couple years ago we found the perfect mix of full sun and good drainage in a high spot near the house, and they’ve been happy ever since. We have several bushes that ripen at different times during the season, so we get early, mid, and late season blueberries. 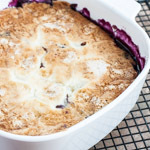 If you are planning to put blueberry bushes in your backyard garden, I highly recommend choosing plants with that in mind, plus make sure you get several so they can cross pollinate and increase yield. Blueberry bushes last for many years, so with proper care you can have blueberries every summer for years to come. 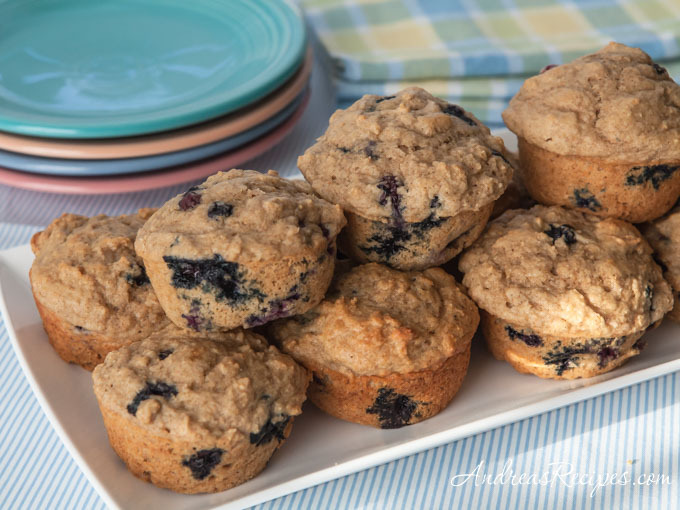 Lemon sugar gives an extra lift of lemon flavor to these blueberry muffins. I simply stir together the sugar and lemon zest, pressing the sugar and zest with my fingers to help release the lemon oil. It will keep for up to a week in a tightly covered jar. Preheat the oven to 375° F/190° C.
In the small mixing bowl, stir together the flour, baking soda, baking powder, salt, and cinnamon. In the large mixing bowl, add the sugar and lemon zest, pressing the zest into the sugar with your fingers. (You can do this up to a week before, and store in a tightly covered jar.) Combine the lemon sugar, lemon juice, yogurt, eggs, and melted butter. Beat until thoroughly mixed. Fold in the dry ingredients just until blended. Do not over mix. 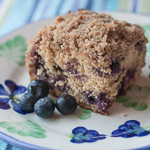 Gently fold in blueberries and then spoon the batter into the greased muffin tins, filling each cup about two thirds full. Bake in the preheated oven until the tops are lightly browned and a tester comes out clean, about 15 minutes. Allow the muffins to cool in the pan for 5 minutes, then remove and cool on a wire rack for another 5 to 10 minutes, then serve.